Moving Mountains For a dose of inspiration, consider the story of the late Dashrath Manjhi. As reported by Upworthy.com, Manjhi is a legend in his home country of India. He is known as the man who moved a mountain with his own two hands. Manjhi hailed from Gehlaur, a small village bordered by the Gehlour Hills mountain range. One day while Manjhi was chopping wood on the other side of the mountain range, his wife, Falguni Devi, attempted to bring him food and water. During her ascent, Devi fell and badly injured herself. Gehlaur was a small and poor village that lacked many crucial resources. The nearest available medical services were located just a mile away—but on the other side of the mountain range—in a neighboring village called Atri. Villagers would sometimes make the safer 45-mile trek around the mountain to reach Atri. Without medical attention, Devi died of her injuries. Devastated, Manjhi pledged to cut a road through the Gehlour Hills to ensure such accidents would never happen again. The year was 1960 when Manjhi sold three goats to purchase a hammer and chisel. His peers, and even his own brother, thought he had gone completely mad. Some said his new- found mission would kill him. "When I started hammering the hill, people called me a lunatic but that steeled my resolve," Manjhi said. Manjhi maintained his daily job working the fields of local farmers while continuing to chisel away at the mountain. Eventually, some of his detractors would lend support by offering food and helping him buy tools. Through the adversity and despite his critics, Manjhi finished cutting his road in 1982. The 30-foot-wide path travels 360 feet through the mountain and is surrounded by 25-foot-high rock walls. Manjhi died of cancer in 2007 at the age of 73. His legacy is a reflection of what we all are capable of in the face of tragedy, adversity and strife. Restyling shops face an uphill battle every day. Selling accessories regarded as luxury items in an erratic market can be a difficult task. Then factor in the big-business automobile manu- facturers that are constantly devising ways to take a bite out of the aftermarket, and you have yourself a significant challenge. The resilient restyling aftermarket has proven its staying power by continuing to innovate through the decades, improving automotive design, performance and safety. With a brazen body kit, upgraded leather, booming audio system, blind-spot detection sys- tem, and enough cargo enhancements to stock a small grocery store, our metaphorical industry vehicle includes an exhaust system that loudly beckons, "We are here to stay." Thanks for reading our Offroad Issue! 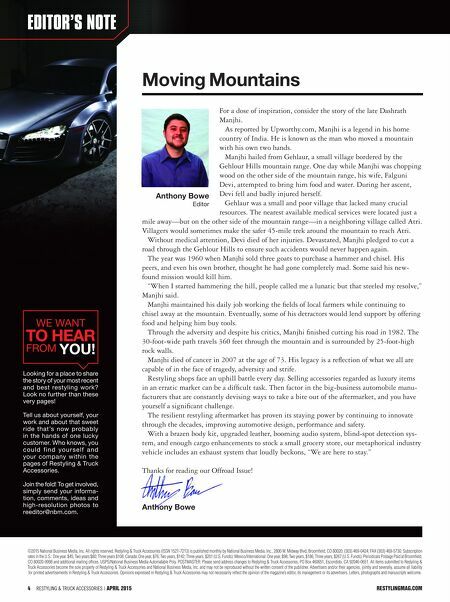 Anthony Bowe Editor's NotE Anthony Bowe Editor WE Want to heAr from you! Looking for a place to share the story of your most recent and best restyling work? Look no further than these very pages! tell us about yourself, your work and about that sweet ride that's now probably in the hands of one lucky customer. Who knows, you could f ind your se lf a nd your company within the pages of restyling & truck accessories. Join the fold! to get involved, simply send your informa- tion, comments, ideas and high-resolution photos to reeditor@nbm.com. 4 Restyling & tRuck AccessoRies | April 2015 restylingmAg.com ©2015 National Business Media, Inc. All rights reserved. 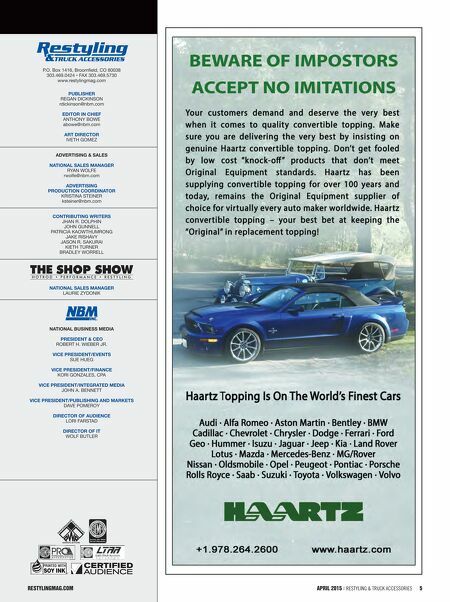 Restyling & Truck Accessories (ISSN 1521-7213) is published monthly by National Business Media, Inc., 2800 W. Midway Blvd, Broomfield, CO 80020; (303) 469-0424; FAX (303) 469-5730. Subscription rates in the U.S.: One year, $45; Two years $80; Three years $108. Canada: One year, $76; Two years, $142; Three years, $201 (U.S. Funds). Mexico/International: One year, $98; Two years, $186; Three years, $267 (U.S. Funds). Periodicals Postage Paid at Broomfield, CO 80020-9998 and additional mailing offices. USPS/National Business Media Automatable Poly. POSTMASTER: Please send address changes to Restyling & Truck Accessories, PO Box 460651, Escondido, CA 92046-0651. All items submitted to Restyling & Truck Accessories become the sole property of Restyling & Truck Accessories and National Business Media, Inc. and may not be reproduced without the written consent of the publisher. Advertisers and/or their agencies, jointly and severally, assume all liability for printed advertisements in Restyling & Truck Accessories. Opinions expressed in Restyling & Truck Accessories may not necessarily reflect the opinion of the magazine's editor, its management or its advertisers. Letters, photographs and manuscripts welcome.